Peeking at my other waterfalls pages shows me that I’m all over the place. 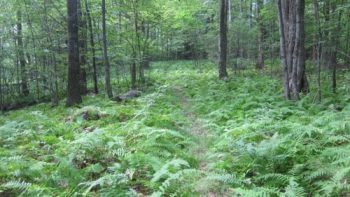 Some are super long, like Nonnewaug Falls and others are much shorter. (It usually depends on if there are other associated pages or not.) I must say, I had forgotten that I’ve actually written up several falls in Connecticut – a state not exactly known for its waterfalls. 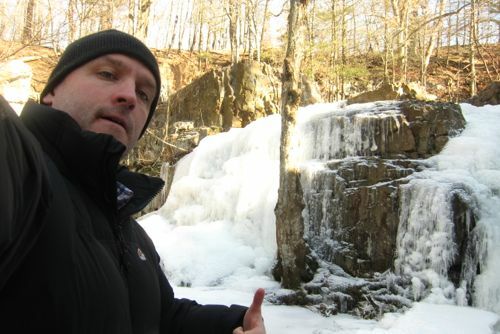 Since the last falls write-up, I’ve been contacted by a writer who is publishing a guide to Connecticut’s waterfalls. He asked me for some help here and there, which was cool. Not sure when it’s going to be available, — update: Here it is. Exciting stuff. 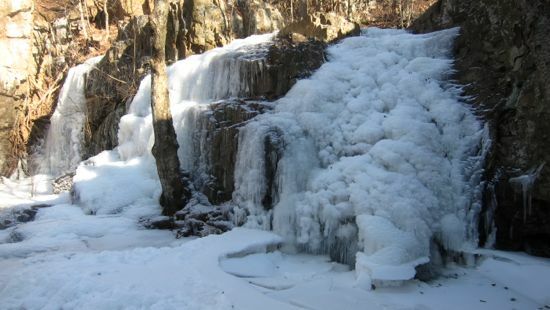 I can’t remember where I first read about Westfield Falls, but it was in the context of, “There is a really pretty waterfall that’s been trashed by littering idiots that isn’t well publicized but you can see it from I-91.” Well, color me intrigued. Even though it was 20 degrees in the middle of January, I wasn’t alone at the falls. There was a family of four traipsing about, doing rather stupidly dangerous things with pre-teen kids. Um, father figure guy? You know they can die here by slipping on the ice and falling 20 feet onto ice and rocks below, right? Sigh. I, being more intelligent, gingerly picked my way around the ice-covered rocks and was sure to check my footfalls before moving across the frozen pools. Even though it was rather safe, there is something disconcerting about walking across the top of a frozen waterfall. The geology here is really quite beautiful. Loads of impressive traprock shears and large cliffs of perfectly cubed basalt. And then there’s the waterfall, of course. It really is one of the best ones in the state. 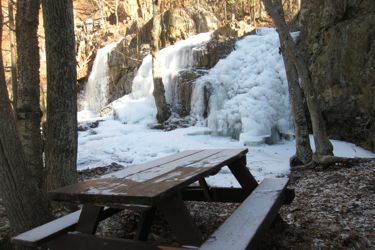 It’s right next to the road (A trail takes you to the base of the falls as well, where there’s a picnic table for your enjoyment) AND it’s right next to the highway. Yeah, the continual sound of traffic on I-91, at least when the falls are frozen in space, is loud and distracting. I’m sure in the spring when the falls are flowing, you can’t hear the highway – and in summer you may not even be able to see it so well. 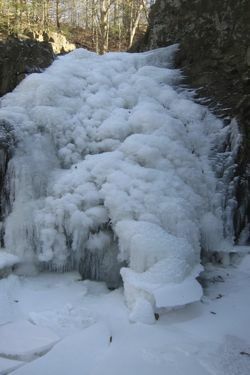 But, there is an obvious special beauty to frozen falls. Trucks be darned. 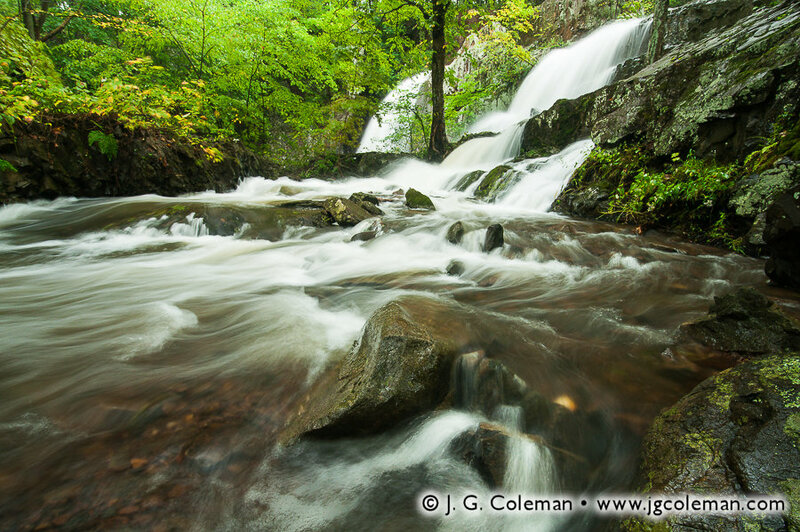 Here are some falls facts from New England Waterfalls. Westfield Falls is a set of two drops about 30 feet apart from each other. The falls on the left are an 18-foot tall plunge, and the falls on the right are a 15-foot horsetail. The brook, which is separated by a rocky island just above the falls, rejoins about eighty feet downstream from the falls. 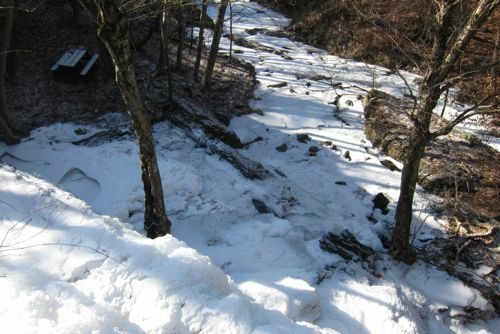 There is also a long slide a few feet downstream from the falls worth noting. Westfield Falls is a beautiful waterfall. Due to its residential location, however, the area around the waterfall has become victim to vandalism and litter. 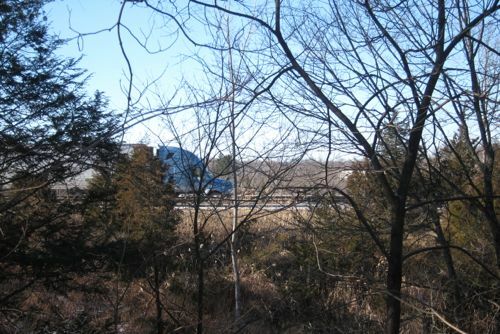 You can also hear the interstate highway. Hopefully, this waterfall will be cleaned up in the near future. If it was, this waterfall would earn a higher recommendation from us in any future editions of this guidebook.